When a tree is growing dangerously close to the foundation of your home. 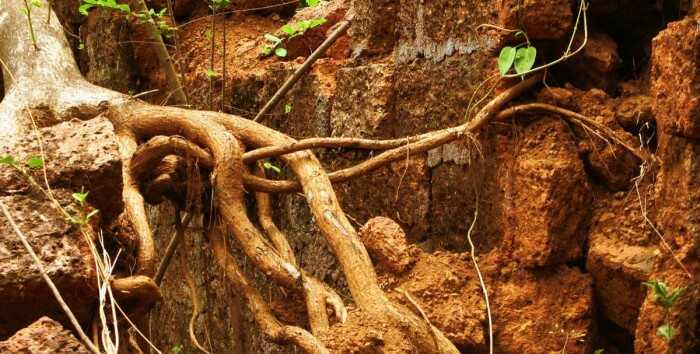 If you strictly want to remove exposed roots for aesthetic purposes, you should reconsider. There is no way to guarantee that you won’t damage the tree by cutting its roots. If you do, you will more than likely have to remove it entirely. Step-by-step instructions for cutting tree roots as safely as possible are highlighted below. Don’t want to DIY? Get a free quote! Examine the root you want to cut. If possible, trace it back to the trunk of the tree from which it grows. Is it one of the largest roots? If so, you’re a lot more likely to damage the tree by cutting it. If it’s relatively small though, you can probably remove it without any major issues. Figure out the right place to cut the root. You shouldn’t just cut the root at random. A good rule of thumb is to measure the diameter of the trunk of the tree in inches. Multiply that number by eight. The total represents the closest place where you can safely cut the root of the tree. You can always cut the root closer than that, but the odds of doing serious, irreversible damage are going to be a lot higher. After finding the right place to cut the root, mark it. Don’t just eyeball it. You don’t want to inadvertently cut it too closely to the tree. You can use spray paint or colored chalk to mark the root. Using a small spade, dig out the soil from around the root where you would like to cut it. You should also dig out some space below the root as well. The goal is to make it as easy as possible to pull the root free after you’ve cut it. For this step, you will need a root saw. Use it to cut the root at the mark that you made. You might be able to use loppers or pruning shears if the root has a diameter of one inch or less. Grab the root by the cut end and pull it up and away from the trunk. Keep doing this until it tears completely free and out of the ground. To make it easier, you might have to use your spade to free up a little more soil along the way. Fill in the resulting trench. You can cover it with sod or plant grass seeds. It’s critical to carefully monitor a tree in the days and weeks after cutting one or more of its roots. If you start seeing dead branches, or if the tree starts to lean, you should be proactive and cut it down before it falls on its own. Want help from a professional? Get free quotes.